Utforsk Tamarindos strender og tørr skog på en off-road ATV tur med elvekryssninger, fjellutsikt og fantastisk tropisk natur. Lær å manøvrere kjøretøyet, følg deretter guiden din langs en robust 2-timers krets. Ta deg til severdighetene og lydene i Costa Rica skog, se etter fugler og apekatter når du styrer under kyststrær, og ri bakveiene og byways av gullkysten. Our group had a great time on this tour! Driving the ATVs was so much fun, especially for my teenage boys. The stops were perfect - even got to see about a dozen howlers hangin in a tree along the way. Our guide, Rainer, was awesome! Don't wear a white shirt :) but highly recommended!!! This tour was so much fun!! They take you through little towns, some amazing scenery, and through small sections of a river. We laughed the entire time and enjoyed everything about it! There were enough parts with shade that it wasn't too hot and our guide was nice enough to take pictures for us from the side by side one in front. The only thing I wish was different was to have more time to stop for pictures just because it was so pretty in some areas. If you have a go pro use it for this tour! I came to Costa Rica with a group of 23 folks and 16 of us took this tour with Carols and his crew. Most of us hadn't rode and ATV, yet we were eager for the experience, albeit not doubt with a little fear and perhaps even some anxiety. BUT, Carols and his team were wonderful and caring and emphasized our safety. 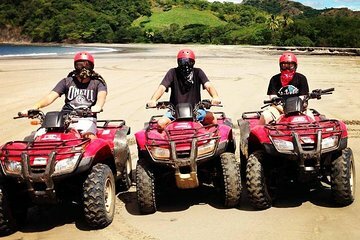 They gave us a quick lesson on using the ATV's then took us out slowly through a very comfortable ride through the neighborhoods of Tamarindo, a few hills over a small river and down through a lovely picturesque beach where we stopped for a group picture. We proceeded to another beach area where we stopped for some refreshments and souvenirs, a lounge on the beach and back to our starting place. Carols and his team made suer everyone was safe and followed along the way, while helping us with gear shifts and for those who were not going as fast, made sure we caught up at significant direction changes or roads where he wanted to make sure everyone was on the same page. The bikes were easier than I thoughts and after about 30 minutes, I felt more comfortable and realized that I control the machine and could go as fast or as slow as I wanted. Even when I fell behind from my group, Someone from Carlos's team always made sure I was ago, even cheering me when I made it over a hill. All and all I highly recommend this tour it was totally worth the money!! Definitely do this tour! Carlos is a fantastic guide and we had an awesome time. Highlight of the trip for my family. Our family had a great time on the atv tour. If you are considering this tour during the dry season please be aware it is extremely dusty! Wear old clothes and shoes that you won't mind getting very very dirty! And bring a bandana for your face! Even with the dust, we all had a fantastic time seeng Costa Rica off the beaten path! This was one of the highlights of our family vacation to Costa Rica! Carlos, our guide, was wonderful. He made sure we were all safe and that we all had the best experience. We visited 3 beautiful beaches, went swimming at one half way through the tour, and we also stopped and had a delicious fresh caught fish with tortillas, some cold beers and sodas for the kids. I would recommend this trip to everyone - we went with kids as young as 5, teenagers, adults and one adventurous grandma! We attended this tour on the next to last day of our trip. It was amazing. We had so much fun! Carlos was very informative and a great guide. Took us to several hidden wonders of Costa Rica. We got to see the howler monkeys with their babies and shell beach with the gay men and crocodiles. Must do!! We booked this because of the name - 'mountains and beach'. The thrill of zooming about the bumpy trails through the lush greenery and to then emerge onto pristine white sands with the ocean before us is one of the high spots of our holiday. The first beach we stopped off - Pirate Cove - was straight out of the movies - Blue Lagoon, Castaway, etc - not a soul in sight and no tell tale footprints in the sand to suggest that anyone ever went there. Just gleaming sand, a rocky island just offshore, the jungle behind and the ocean in front. Our guide Carlos was careful to make sure that we took it all at our own pace, speeding along for the thrills and giving us all the time we wanted to splash about in the sea. Thoroughly recommended for all ages - we had 13 to 61 years old. Our group of 12 had a great time! We had new riders and the instructions given were clear and the leaders, Carlos and Jason, were great. Beautiful country and the beach, Playa Conchal, was absolutely amazing. The ATVs were new and in great condition and the fruit watermelon was refreshing after a dusty ride. Highly recommended! Our first ATV tour ever! The guide from Pininos Adventures was very good both at teaching us how to use the ATV's and at explaining everything to us about the beaches we visited. We saw a number of iguanas on this tour as well as monkeys. Lots of fun!